(1) S'rî S'uka said: 'When his father chose the path of liberation and Âgnîdhra, as ordered, took his place, he, strictly following the dharma, protected the citizens, the inhabitants of Jambûdvîpa, like they were his children. (2) One day he desired a woman from the realm of the godly and engaged in austerities at the foot of the mountains where their playground is found. After he, in compliance with the rules of his forefathers, had gathered all the necessities for the service, he, fully attentive executing penances, was of worship for the master, the highest power of creation in the universe [Lord Brahmâ]. (3) Understanding [what he wanted] the almighty Lord, the first person of the universe, sent down from his abode the celestial girl, the Apsara Pûrvacitti. (4) She there wandered around in the woods near that place of meditation, that most beautiful was dense with various trees with masses of high reaching, golden creepers attached to the branches. The clear waters of the lake filled with lotuses resounded with the vibrations of the pleasant sounds of communicating pairs of land birds and on their turn responding water birds like ducks and swans. (5) The prince then, in the ecstasy of his yoga, heard the pleasant sounds of her ankle bells, that tinkled with every step she made with her so very attractive way of moving around playfully. Looking up with his half open lotus bud shaped eyes, he spotted her. (6) By her playful movements, shy glances, humility, sweet voice and by her limbs beautiful to behold and contemplate she, nearby just like a honeybee smelling the beautiful flowers, paved for both normal men and men of heaven the way for the flower bearing god of love. The goddess was stunning, making herself heard by the sweet nectar pouring out of her smiling and talking mouth, the sight of the hasty, stylish, little movements of her feet to [escape] the intoxicated bees surrounding her, the movements of her jug-like breasts, the weight of her hips, the braids of her hair and the belt around her waist. The mere sight of the goddess brought him fully under the control of the almighty Cupid and thus he seized the opportunity to address her. Third revised edition, loaded February 2, 2018. S'rî S'uka said: 'When his father chose the path of liberation and Âgnîdhra, as ordered, took his place, he, strictly following the dharma, protected the citizens, the inhabitants of Jambûdvîpa, like they were his children. One day he desired a woman from the realm of the godly and engaged in austerities at the foot of the mountains where their playground is found. After he, in compliance with the rules of his forefathers, had gathered all the necessities for the service, he, fully attentive executing penances, was of worship for the master, the highest power of creation in the universe [Lord Brahmâ]. Understanding [what he wanted] the almighty Lord, the first person of the universe, sent down from his abode the celestial girl, the Apsara Pûrvacitti. She there wandered around in the woods near that place of meditation, that most beautiful was dense with various trees with masses of high reaching, golden creepers attached to the branches. The clear waters of the lake filled with lotuses resounded with the vibrations of the pleasant sounds of communicating pairs of land birds and on their turn responding water birds like ducks and swans. The prince then, in the ecstasy of his yoga, heard the pleasant sounds of her ankle bells, that tinkled with every step she made with her so very attractive way of moving around playfully. Looking up with his half open lotus bud shaped eyes, he spotted her. By her playful movements, shy glances, humility, sweet voice and by her limbs beautiful to behold and contemplate she, nearby just like a honeybee smelling the beautiful flowers, paved for both normal men and men of heaven the way for the flower bearing god of love. The goddess was stunning, making herself heard by the sweet nectar pouring out of her smiling and talking mouth, the sight of the hasty, stylish, little movements of her feet to [escape] the intoxicated bees surrounding her, the movements of her jug-like breasts, the weight of her hips, the braids of her hair and the belt around her waist. The mere sight of the goddess brought him fully under the control of the almighty Cupid and thus he seized the opportunity to address her. 'Who are you and what do you intend do on this hill, oh choice of the munis? Are you some illusory appearance of the Supreme Lord, our God in the beyond? Dear friend, do you carry your two bows without strings [your eyebrows] for your own protection or are you hunting the heedless animals in this forest? These two arrows [these eyes] of you, oh fortunate lady, that have feathers like lotus petals, have no shaft and are peaceful and very lovely. Who do you want to pierce with their sharp heads, loitering around in this forest? May your prowess be of service for the welfare of all of us who dull-witted fail to understand this! All these followers around you [the bees], oh worshipable lady, are enjoying the resort of the tresses of your hair and all the flowers falling down from them, while they incessantly sing unto the Lord the prayers of the Sâma Veda and the Upanishad, like being sages of respect for the different types of Vedic literature. From the resounding vibration alone of your ankle bells, I can very distinctly hear the tittiri birds, oh brahmin [girl], without seeing their form. Seeing your beautiful round hips with the lovely color of kadamba flowers and around them a belt red as burning cinders, I wonder where your [ascetic] bark dress would be. What is it, oh twice-born one, that fills the two horns, oh heavenly appearance of beauty, that you carry to your slim waist? What do they contain that is so attractive to my eyes? And what is that fragrant red powder on the two of them with which you, oh fortunate one, are perfuming my spiritual resort? Please show me where you live, oh dearest friend. Where was a person with such wonderful limbs like you born? For a person like me the many wonders of your lovely words and inviting gestures that are as sweet as nectar to the mouth, are something very arousing. And what kind of food you have in your mouth? I can smell the pure ingredients of what you are chewing, my sweetest. You have to be an expansion of Lord Vishnu, with your two wide open eyes and brilliant restless shark-shaped earrings in your ears, the rows of your beautiful teeth and your face that resembles a lake amidst the swarm of the bees around you. My eyes are restless being distracted by the ball you strike with your lotus palm in all directions. Do you not care about the curls of your hair hanging loose? Is that lower garment of you not giving you trouble being taken up by the wind, like a man does who is interested in a woman? Oh beauty, oh treasure of the sages, by what austerity did you manage to unsettle this way [with this body] so unfailingly the penance of all retired souls? You should practice the austerity with me, oh friend. Maybe you are meant for me because the creator of the created [Brahmâ] is pleased with me. S'rî S'uka said: 'Very expert in winning over women, he thus as intelligent as the gods with his flattery managed to gain the favor of the heavenly girl. She who also was attracted to the intelligence, manners, beauty, youth, opulence and magnanimity of him, that master among the heroes, then enjoyed all earthly and heavenly pleasures, for an endless, countless number of years spending her time in attachment to him as the king of Jambûdvîpa. Âgnîdhra, the best of all kings, begot in her nine sons named Nâbhi, Kimpurusha, Harivarsha, Ilâvrita, Ramyaka, Hiranmaya, Kuru, Bhadrâs'va and Ketumâla. After she year after year had given birth to her sons, Pûrvacitti left home in order to return to the unborn godhead [Brahmâ]. The sons of Âgnîdhra, who because of their mother's care had strong, well-built bodies, were by their father allotted the divisions of the kingdom of Jambūdvīpa to be ruled by them that he gave their names [probably the Eurasian continent]. King Âgnîdhra, not satisfied in his sensual desires, thought every day more and more about her, and [thus], as it is described in the scriptures [in e.g. B.G. 8: 6], reached the place in heaven where she resided, the place [Pitriloka] where the forefathers live in delight. 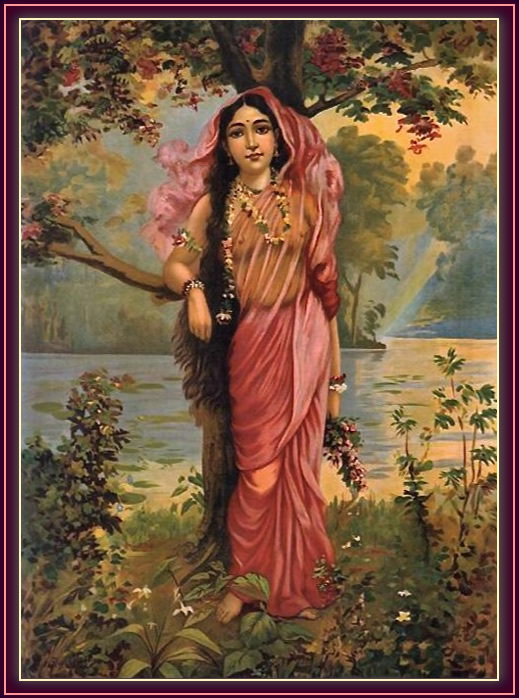 The painting is titled: 'Vasanti" and is painted by Raja Ravi Varma.